Kelly has a passion for wellness. She is dedicated to continuing her education to help clients heal naturally. Since 2006, she has been using a holistic and energy based approach to healing. She is thrilled to have the opportunity to help others in her community with such a valuable complementary therapy for prevention, emotional well-being, and for overall healing. She continues to practice Reiki energy healing and offer clients time away for relaxation, stress reduction and healing in a whole-person care environment. Kelly is honoured to work with clients from all walks of life and invites everyone to her treatment table to facilitate healing in an exciting way! Wondering if Reiki is right for you? 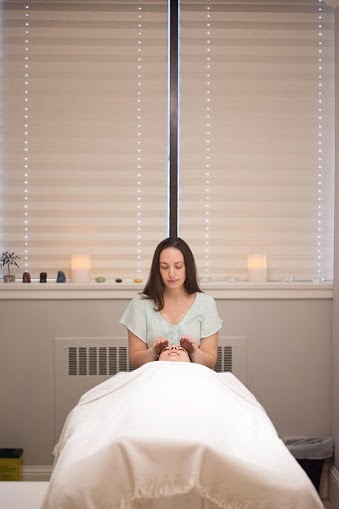 Never experienced a Reiki treatment before? Are you a new Reiki practitioner? If you have questions about Reiki, feel free to send an email to Kelly Sabara, Reiki Master Teacher. Kelly has over 10 years of experience as a Reiki practitioner, 7 years experience as a Reiki Master and she has been teaching Reiki since 2013. As a certified Reiki teacher in both traditional Usui Reiki and Karuna Reiki®, Kelly is knowledgeable, friendly, and open to all questions and discussion about Reiki. Please Note: Kelly is currently taking a leave of practice from Dr. Ellen Simone, ND & Associates but will return in Sept. 2019! Reiki works on mental, emotional, physical and spiritual levels. Through a practitioner’s hands, powerful life energies are transferred to the recipient, releasing blockages and promoting physical and emotional health. By receiving universal energy, the client has the ability to take this energy and use it for what ever purpose is needed. For some people that may be to relax and experience peace, balance and well-being. For others Reiki will initiate and promote a deeper healing at the emotional and spiritual levels which may be expressed by the appearance of new thoughts, awareness and behaviour. That is what makes Reiki so exciting and self-empowering.